Deriving actionable insight needs more than just technology. BI & Analytics Officers are likely to plan why and what they need to analyse- i.e. what will they change as a result of these new insights. Without analysing this vital information is missed, decisions are poor and profitability suffers.It is not untypical to find 90% of an insurers data is inaccessible! A Chief Data Officer is needed as much as a Chief Analytics Officer. That makes a strong team together with a Chief Digital Officer. That's a sign of moving from being analogue to being digital! 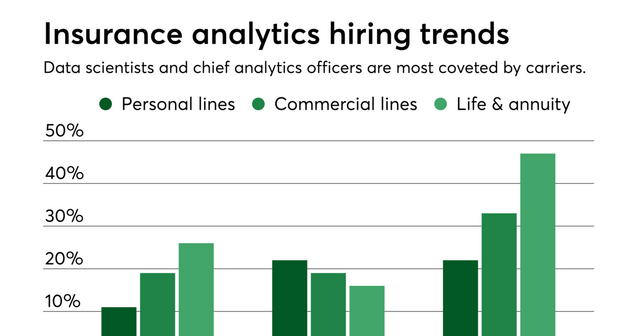 As insurers evolve their analytics strategies from gathering information to interpreting data, the appointment of chief analytics officers and data scientists have become more prevalent throughout the industry compared to that of chief data officers, according to a new study by Strategy Meets Action. Currently, 22% of personal lines carriers, 19% of commercial insurers and 16% of life & annuity companies have chief analytics officers, SMA finds, Its report “The new era of insurance analytics: Leveraging the SMA data and analytics spectrum,” surveyed 87 insurers.